As the New Jersey Council on Developmental Disabilities (NJCDD) has discussed before, one of the ways in which people with disabilities are discriminated against is in the workplace. We have some of the highest unemployment rates in the nation. 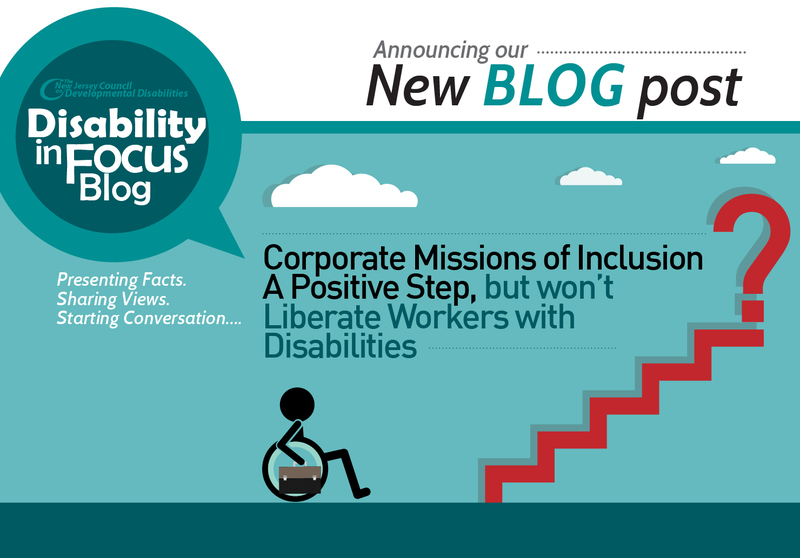 Many companies may merely not want to “deal with” providing the accommodations necessary for workers with disabilities to function. The fact is that usually, instead of hiring workers with disabilities and failing to provide the appropriate adjustments, many companies just opt not to hire them at all. Thankfully, this dismissive culture may be changing. That, in and of itself, is good. Representation does matter, and it is better than not being represented. However, companies often drive cultural shifts, just like media representation. Unfortunately, this is to say very little about the material reality of the marginalization of workers with disabilities on the whole. An article in Forbes explains how disability inclusion is just as important as any social justice issue. New York State Comptroller, Thomas DiNapoli wants to help lead the way on this attempted cultural shift. “From pushing corporations on labor rights, on the need for there to be more women on corporate boards, on LGBTQ non-discrimination, on the environment and climate change, on executive compensation, on disclosure of corporate political spending, New York will have the most robust corporate engagement initiatives of any state fund, adding, “We are starting 2019 with a new effort to press corporate America to have clear policies on disability inclusion,” DiNapoli said. Initiatives such as these may do some good. They attract attention to inequality. They attract attention to social injustice. They try to remind consumers that it’s important to consider the needs of all, no matter their gender, age, race, nationality, sexual orientation, religion or disability status. These large companies donate to charities and other philanthropic efforts. They have foundations. They have pet issues. They make commercials pledging their support to this or that marginalized community They, companies, care. Ultimately, these companies care about how much money people with disabilities can make them. The talent management and human resources company TLNT explained in a blog the money-making potential of the 38 million Americans with disabilities over the age of 16. TLNT cited a paper released by the Boston Federal Reserve. Inclusion in the narrative of our potential purchasing power is not necessarily a bad thing, only in the sense that it is better to be included than it is to be excluded. As long as the economy exists as it does, we can be made into a valuable asset. The fundamental question, however, is whether we should be described in terms of market metrics at all. TLNT was not done lauding our ability to make money for employers. Diversity of market demographics is, indeed, diversity, but it’s a pretty vulgar form of it that should not be our ultimate goal as we strive for recognition. Perhaps for the employers of “the professional sphere” we are only as good as the money we can make, the buying power we can generate. It is a small step in the right direction for employers to acknowledge we have potential. However, we need resources, accessibility and inclusion on our own terms, not in the terms of the profit motive.